prior to GK4 between liverpool and london, daniel and i met up to figure out what went wrong with google hangouts during GK3. with its youtube, chat, and multi-user videoing, we thought it might be the holy grail to GLTI.CH karaoke, only to be proven wrong as it automatically muted and canceled out sound every time we attempted to sing together. this annoying feature still makes skype or something akin to it necessary. 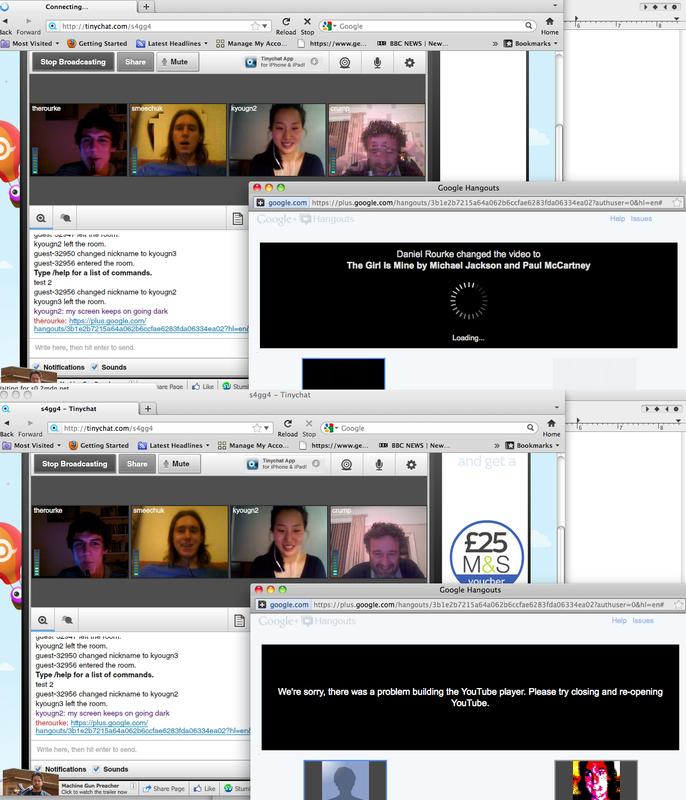 so here’s what we figured out with the skype plus google hangout combo: start with skype first. then open google hangouts, but mute the video and sound; this will not cancel the youtube video. open the youtube feature and load up a song. pause it at the beginning for about 10-30 seconds. one person presses play. also very important is to have a separate audio in and out and adjusting mic/speaker settings on your computer to optimize sound. also, keeping open the chat feature in google hangouts allows for the creation of an organic real-time song list while the singing’s happening. that’s more or less the how-to. in essence, google hangouts serves as the karaoke machine. skype serves as the event video/sound feed. the separate audio/in (with external mics/speakers) is necessary because otherwise you get the canceling out of sound again with google hangouts and skype vying for attention like toddlers to your mother of a frazzled computer (sorry for the crappy metaphor). likewise, opening skype first is important because otherwise, google hangouts takes over your webcam. discovered that even after closing google hangouts, sometimes (and maybe it’s just because my poor computer is on its last legs) will still say the camera’s unavailable for a while before letting skype video take over. the muting of the video and mic in google hangouts is necessary because otherwise you get an eternal sound feedback loop, which in and of itself, offers a space for some creative potential, but is crazy annoying for some basic GLTI.CH karaoke. also, re the 10-30 second wait before starting a song–without that, the videos won’t sync up. this was essentially the set-up for GK4. on the london end, it was a mad scramble as we worked off a 3G connection with very limited bandwidth that resulted in minimal to no connections with liverpool. and also without a proper sound mixer (something we realized this go-around is pretty essential should we want to do a Big Event). literally at the 11th hour, mostly due to daniel’s brilliance, we set up 2 computers pulling off of another internet connection from the cafe/real estate office across the street (that we just hoped didn’t turn off its internet on closing). so daniel’s computer was running the skype off the meanwhile space account, and mine was running the google hangouts off the stolen wifi. to add to the fun, my computer being on its last legs decides on a whim to go dark every now and then. so we pulled out a monitor from the meanwhile back room and connected that to make things look very 1999. right speaker audio from daniel’s computer, left speaker audio from mine. GLTI.CH Karoke indeed. of course we’d prefer to just have a solid, strong connection without the bandwidth issues of a roaming 3G network, a sound mixer, studio quality amps, and two properly functioning computers. ultimately, we’re not gluttons for punishment. but GLTI.CH is about making do with what we have. and working with 2 relatively old computers on crappy networks without a mixer and still pulling it off, demonstrates that the thing can be done. just requires a bunch of futzing. during our testing leading up to GK4, daniel and i also came across synchtube, which in many ways offers the best out-of-the-box solution to telepresent karaoke yet. it does all the things google hangouts does minus the canceling of sound, allows people to come in and out of the virtual room or just watch should they wish to, and with a synchtube channel, it offers some real easy potential for the 24-hour karaoke-athon. however, the videos are TINY, diminishing the fun factor that is seeing the people with whom you’re singing. synchtube uses tokbox that allows for free embedding of video apps and such in websites; also something more to explore. this leads to the next step in the GLTI.CH karaoke dream. the multi-user GLTI.CH karaoke room. this was one of the awesome appeals of google hangouts, and as it allows for up to 12 users in any given hangout, still one of its appeals. but again, see hangouts’ drawbacks above. then synchtube has the tiny video problem. enter skype. skype conferencing in my book, still offers the best interface for video in that the videos are adjustable in size and generally the connection the best of them all. however, you get this for a price. and sure, the subscription price makes sense if you multi-user conference with your family/friends/colleagues strewn across the globe pretty regularly. but if you just want to GLTI.CH karaoke, it’s a steep entrance fee. having only worked on hooking up 2 locations at a time, the practical issues of multi-usering GLTI.CH hadn’t really entered our minds until this past week. when we realized daniel and i may need to skype into the GLI.TC/H chicago conference from separate locations. which in turn led to thoughts on using the conference as a testing ground for multi-user GLTI.CH in which we could also conference in sam meech (of GK4), and really anyone else who wants to for the karaoke action during our presentation. so either eat the cost of a skype conference subscription, or find an alternative. 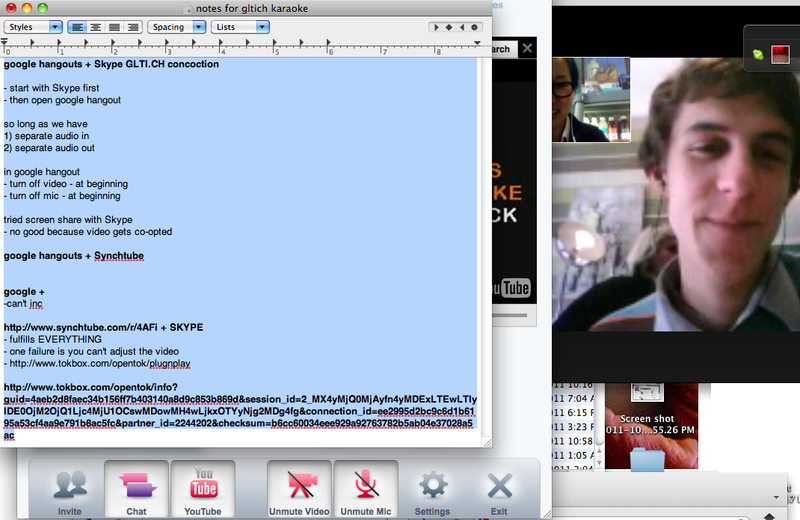 daniel found tinychat, which is brilliant in a number of different ways. the videos are still small, but they’re bigger than those on synchtube. it’s multi-user, but more than that, knowing that mic settings and whatnot need to be changed, it provides very easy frontend mic and sound adjustment settings for the newbie. also, tinychat has a smartphone app for the roaming amateur singer. daniel, sam, crump, and i tested it last night with “the girl is mine” google hangouts still serving as the karaoke machine. unfortunately, the youtube feature on my hangout failed. but everyone else’s was fine. leaving me listening (and occasionally chiming in) to an a cappella version of the jackson mccartney classic by the others. again, another glitch worth mining and blowing-up in its own regard. for instance, maybe boys II men next time? in a few hours, we’ll be linking up with the GLI.TC/H conference in chicago. for a tinychat + google hangout GLTI.CH test. if you’re around at 5:30PM chicago time, you’re welcome to pop in. otherwise at 7:30PM and maybe we can crash some systems.